When last I left, I had verified that the implementation of Quick Search was safe: the modified algorithm didn’t access memory it shouldn’t, it didn’t have numeric overflows, and it didn’t modify anything outside of its own implementation. And, using Frama-C, the process hadn’t hardly been torturous or even particularly unpleasant at all. The most important tasks were describing the requirements for calling the two functions. Those requirements are…detailed…but nothing more than what an experienced C programmer would have in mind while writing or calling the functions. A final set of shiny set of annotations ensured that the loops and the variable modifications needed by them behaved themselves. But I hadn’t done anything about proving that the function actually did what it claimed it was supposed to do. It’s not hard to understand (one of the reasons I like Quick Search), but the ANSI/ISO C Specification Language is unfamiliar and I didn’t know how to express what went on, where. Fortunately, Yannick Moy, a software engineer at AdaCore, came to my assistance with an excellent introduction to doing the same thing with SPARK, and Loïc Correnson, one of the creators of Frama-C, popped in with some excellent suggestions (and very flattering comments). So now, for your software verification pleasure, here is my essay at proving the correctness of Quick Search. It pretty much follows the same pattern as Yannick’s, but I did come up with a slightly different postcondition for make_bad_shift. 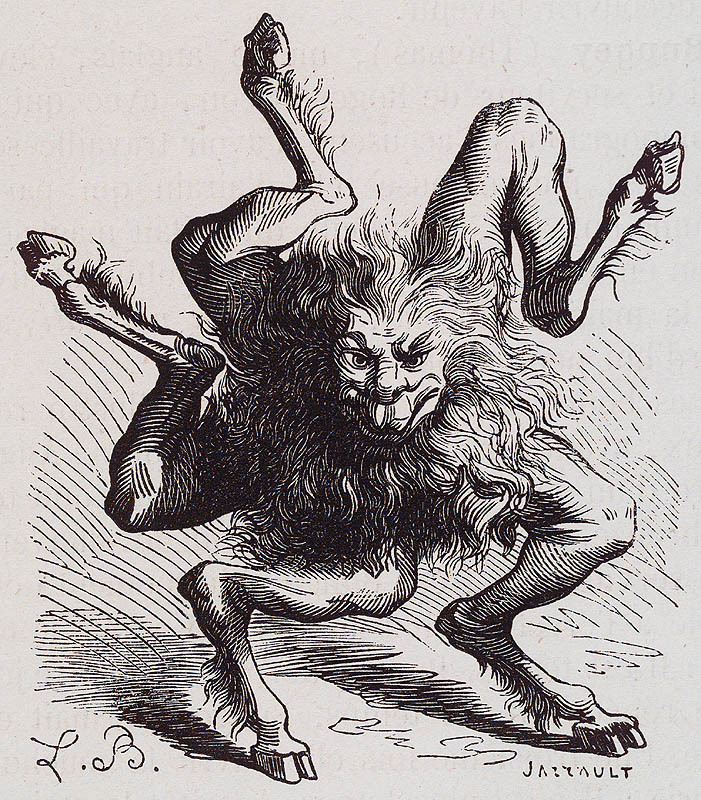 Buer, a demon of the second class, from J.A.S. Collin de Plancy, Dictionnaire Infernal, Paris, 1863. He teaches philosophy, logic and the virtues of medicinal herbs. Also, he’s good at fight sequences in various action movies. To start with, I stole the partial_match_at predicate from the brute force search post, cleaned it up a little and renamed it match_at since I really don’t need two versions of the goofy thing. I’ll come back to the loc ≤ h - len clause in a bit, but the remainder simply says that the needle matches the haystack starting at loc, up to the offset len. Oh, and I replaced the ASCII ACSL tokens with the spiffier Unicode math symbols: among others, ∀ replaces \forall. In the future, though, I’m going to stick with C’s == rather than ≡, since the font I’m using doesn’t do a spectacular job with the Unicode character IDENTICAL TO. The specification of the function make_bad_shift is mostly unchanged from the previous post; the addition is the correctness postcondition. Yeah, those two lines towards the bottom. For reasons I don’t want to go into, I parameterized this function by the size of the character set that makes up the strings, chars. (Well, ok, “reason” probably doesn’t have much to do with it.) Thus, the postcondition predicate is quantified over all characters c in the alphabet of the strings, which is assumed to be between 0 and chars. To understand this predicate, you have to go back to the fundamental idea of the faster string search. This function is initializing a bad character shift array, where the indices are characters and the values are shifts of characters to skip in the haystack: portions of the haystack that do not need to be examined because no match is possible in those locations. The bad_shift map takes the character following the end of a failed match of the needle and turns it into the longest shift that is possible given that character. where the shift has made the c in the haystack align with the c in the needle. The interesting thing to notice about both those cases is that the character in question does not occur in the needle from the position immediately after that identified by the shift to the end of the needle. This last fact is what the postcondition predicate expresses: for any character c, all of the characters after the final occurrence of c in the needle if there is one—n - bad_shift[c] is the final occurrence of c; adding one indicates the next character—or all of the characters in the needle, if there isn’t—n - bad_shift[c] + 1 is 0—do not match c.
Calculating this magic shift value is what make_bad_shift does. The third loop invariant of the second loop is the clause that allows Frama-C to prove that the final, correctness, postcondition holds. It is the final postcondition with the length of the needle, n, replaced by i, the index of the next element of the needle to be evaluated. Like all good loop invariants (well, ok, some good loop invariants), this predicate is trivially true at the start of the loop, since n - bad_shift[c] + 1 is n − (n + 1)+1, or 0. Furthermore, it is maintained by the loop because n − i is the current offset from the end of the needle. With that in place, I can describe the Quick Search function itself. The public contract for QS is almost identical to that of the brute force search. The guarantees made by the function are the same and the only difference in the preconditions are a requirement that the elements of needle be valid when used as indices into bad_shift. By the way, back at the top of this post, I mentioned match_at and the uninteresting, but seemingly unnecessary, conjunct in its definition: loc ≤ h - len. That little guy is seemingly unnecessary because the location of the start of a copy of the needle cannot be found at a location greater than (h − n): There simply isn’t enough room for the needle. However, the code and specifications here are apparently not strong enough to prove that guarantee directly, with the result that it is only possible to prove, in the failure case, that there is no match between 0 and (h − n). Presumably, I could find some way to logically express the impossibility. Or, I could just rule it out in the definition of match_at by adding loc ≤ h - len, which is the route I took. With that conjunct in the definition of match_at, the failure case is wonderfully complete, showing clearly that there is no match in the haystack. Upholding the overall guarantees of the contract, however, is a bit of a complication. This is the complete implementation of Quick Search, including the ACSL assertions necessary to prove its correctness. On the one hand, I know that the shift described by bad_shift gives me the length of the longest non-matching suffix of the needle. On the other, I need to show that, given a location in the haystack, there cannot be a match between that location and the shifted location. Think of the assertion in the loop as a witness: g moves from just after the current location, i + 1, to just before the next location the algorithm examines, i + bad_shift[ haystack[i + n] ]. With every iteration, the assertion indicates precisely where the mismatch described by the postcondition of bad_shift lies. That allows Frama-C to conclude that there is no match at the current (or previous) locations given by g. Thus, since there is no match at i and no possible matches between i + 1 and i + bad_shift[ haystack[i + n] ], the overall loop invariant of the outer loop is satisfied and QS is proved correct. As the situation now stands, I have proven that Quick Search satisfies its specification—a return value between 0 and h − n indicates it found a valid match and a return value of -1 indicates no match exists. Almost. What I have actually proven is that Quick Search with a funny loop in the middle that does nothing useful at run-time satisfies its specifications. Which is just not good enough. Sure, with enough optimization, the compiler will probably throw the loop away. Still, it is an unpleasant wart to have executable code to do nothing other than satisfy the verifier. Enter ghost code. Ghost code is treated as normal code while verifying the properties of the program, but ignored by the compiler while producing executable code. Ghost code in Frama-C is contained in ACSL comments marked by the keyword “ghost”. In QS, the first statement that can be made ghostly is the declaration of the variable g.
The remainder is the useless loop in the middle of the function. Within the comment block, the ghost code uses normal C syntax, while only the single line “//@” comments are available for ACSL specifications. The result is the moderately unpleasant single line of clauses that applies to the loop—loop clauses such as assigns and invariants must immediately precede the loop statement itself. Probably you should use an external regular function that holds the ghost loop. Simply pass the pointers to both ghost and non-ghost values to the “ghost” function. Then you can just call the C-function in a one-line ghost code. Not only it will be less invasive in the original source code, but it cuts the surrounding proofs too. For people interested, this is an occurence of the lemma-function pattern developed in Dafny and Why-3 tools. Interestingly, WP was initially designed with functional properties in mind, not safety : we already have Frama-C/EVA (or ASTREE, or …) for that purpose. Using -wp-rte is more a trick than a feature, that still does the job, indeed. However, you may pollute your functional proofs by a lot of « mumbling » assertions regarding overflows and such. And SMT solvers quickly break down with all this garbage. And unfortunately, I haven’t looked at the EVA plugin as a way of avoiding run-time errors. I’m not sure how I feel about the thing; I’m quite fond of the WP annotations for avoiding errors since they express exactly the ideas that go through my mind when thinking about calling a C function. And with that, Quick Search has been fully verified. There is one…issue (I won’t use the word “error”) with this verification, as written. It’s related to a problem described in “An empirical study on the correctness of formally verified distributed systems.” I’ll leave it as an exercise to the reader to find it. Quick Search here has the same…issue. Yannick was kind enough to meet the exercise. The issue from “An empirical study” is that brute_force and IronFleet’s RSM server (and Quick Search) are under-specified (or over-implemented, if you choose to look at it that way). The RSM server implemented once-only semantics although its specification did not mention that fact. brute_force and Quick Search actually find the left-most copy of the needle in the haystack, if more than one copy exists, but do not include that their guarantees. There is more to be said on this subject, and I hopefully will soon get around to saying it. But for now, Quick Search is relatively easy to fix. A simple addition to the ensures clause of the success behavior, of a conjunct that says that no earlier match exists, does the trick. This addition, in fact, is already satisfied by the code and the invariant of the outer loop, so no additional work is needed! Here is the complete code to Quick Search. @ // loc in the haystack of length h. A complete match has length n.
Do keep in mind that neither match_at nor lemma_no_match_in_shift below, nor any of the ACSL specifications in either make_bad_shift or QS, have any cost at run-time. As an aside, there are a lot of ACSL comments in the code. If you live somewhere with a requirement of one or more comment lines per line of code, ACSL would seem to be a very good (and productive!) way of satisfying that requirement. And look, Ma, no Peano arithmetic! Not a single Zero or Successor in sight!